New research from Nielsen reinforces an important point for those of us in the residential home entertainment systems – no matter what the platform, Americans have an ‘unwavering love for music.’ File this report in the “Good News” department. The music industry is seeing strong growth as defined by data on music consumption. According to a recently released study by Nielsen, 2018 saw “significant overall growth” as compared with 2017. The market researcher says that “total album equivalent audio consumption” was up 23% over the previous year. That is a big increase that Nielsen says was largely driven by a…wait for it…49% increase in “on-demand audio song streams.” Wow. The numbers from this report are sometimes so staggering that they stretch credibility. 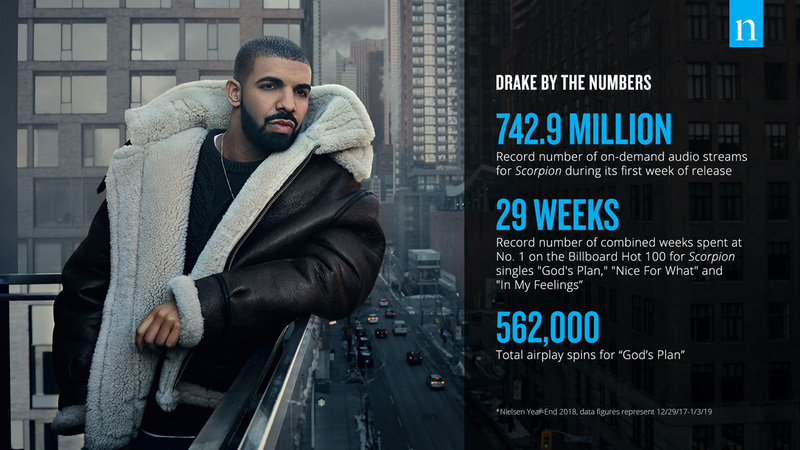 For instance, Drake’s “God’s Plan” song (audio & video streams combined) had more than 1.5 billion (yes with a “b”) total streams. Thanks to this, Drake topped the Billboard Hot 100 chart for 11 weeks. Think that’s a fluke? Ed Sheeran’s “Perfect” was a leader in song sales, with 1.3 million in permanent downloads in 2018. Keep in mind, this is not “streams” in your free Spotify plan…these are actual purchases of the song from digital download sites. Total on-demand audio song streams reached 611 billion in 2018. This is up a full 49% over 2017. Total on-demand overall streaming (audio & video) hit more than 900 billion streams in 2018 – up 43% over the previous year. Vinyl sales continue to show increases, up another double-digit 15% over 2017. That means that vinyl sales have grown EVERY year for the last 12 years in a row. Still think increasing vinyl sales are a fad? Digital purchasing overall is showing sharp declines, but Digital Audio Consumption (defined as digital albums + track equivalent albums + on-demand audio streaming equivalent albums) was up “a healthy 34%,” Nielsen says. 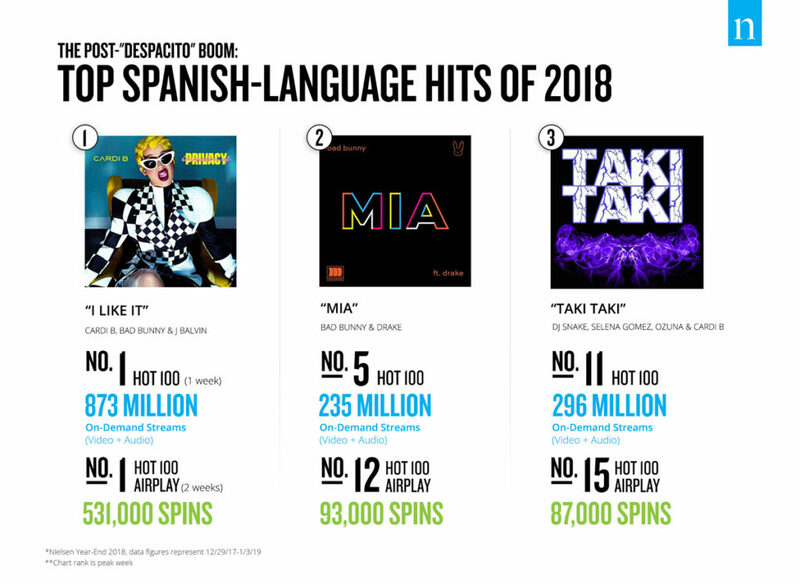 Latin’s Top 40 Takeover – Nielsen is unequivocal here – “Bilingual hits were en fuego on streaming,” and on broadcast radio as well. Noting that in 2017, the top Latin Urban hit was Luis Fonsi’s “Despacito” which succeeded in crossing over into English-language pop and hip-hop channels. That trend will continue with music from Cardi B, Bad Bunny, J. Balvin, Selena Gomez, and more scoring big hits. The Year of Drake – We’ve already mentioned the success of Drake’s “God’s Plan” single, but his accomplishments go well beyond that impressive result. Drake’s album “Scorpion” scored 742.9 million on-demand streams the first week after it was released. Three separate songs off that album – “God’s Plan,” “Nice For What,” and “In My Feelings” – each went on to a No. 1 on Billboard’s Hot 100 for a combined total of 29 weeks. 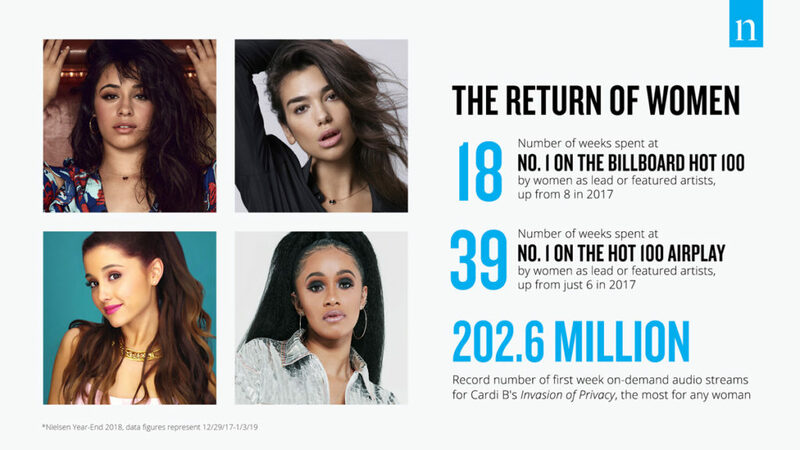 A Triumphant Return of Women – Female artists hit it big in 2018, according to Nielsen’s data. The researcher particularly notes that artists Cardi B, Camila Cabello, and Ariana Grande all had big hits. As a group, female artists held the No. 1 slot on Billboard’s Hot 100 for a combined total of 18 weeks in 2018. That was well over 2017, when they held that slot for 8 combined weeks. Clearly, I am woman hear me roar! Soundtracks Hit It Big – OK, I’ve always viewed soundtracks as a weird category. The success of any soundtrack is dependent on how well the movie or Broadway show to which it is attached performs. For example, in 2018, the group Queen saw its song “Bohemian Rhapsody” became one of only two songs to ever re-enter the Billboard Hot 100 for a third time in three different decades – thanks to the Golden Globe-winning success of the movie by that name. Other hits in 2018 include soundtracks for The Greatest Showman, Black Panther: The Album, and A Star is Born (with Bradley Cooper and Lady Gaga. K-Pop Finally Makes the Grade – K-Pop are state-sponsored, formula-driven Boy- and Girl- acts out of Korea…designed to help put Korea on the cultural map around the globe. 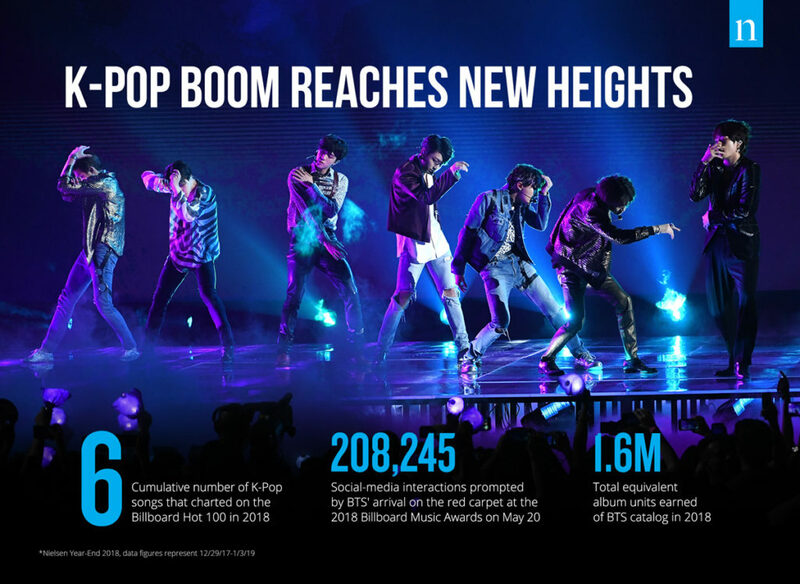 In 2018, the formula finally began to get some real traction in the U.S. Boy-band BTS had their album “Love Yourself” debut at No. 1 on the Billboard Hot 100 chart (their second such feat). But 2018 was the first time we saw success on U.S. charts for multiple K-Pop groups. Nielsen specifically mentioned: BTS, Girl-group BLACKPINK, and Boy-band EXO. Nielsen thinks the approaching 5G technology – with its faster streaming, always on, easy to access attributes – will further drive music engagement propelling these numbers even higher.